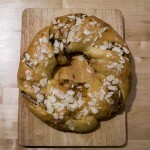 Apricot couronne | Oh. You here. I got quite obsessed with the show “Great British Bake off”. Not only is the British version the only one without stupid judges, stupid contestants and stupid drama, it makes you want to bake so so much. This is my take on the Apricot Couronne recipe by Paul Hollywood. And what should I say? It tastes so so good. It is a sweet enriched yeast dough, filled with dried apricots, walnuts and raisins, with a glazing of apricot jam, powdered sugar and almond flakes. The whole thing is twisted to give several layers alternating with dough and filling. The bottom gets crispy, the center juicy and the top is nice and sweet with the glazing. I stop now and get myself another piece. Previous PostIreland! Day 7! There might be giants! Next PostThe only recipe you’ll ever need.